Reminder: the Calais jungle was a violent no-go war zone. “The situation was rather tense at this station. The police regularly had stones thrown at them,” Mr Sudry said. 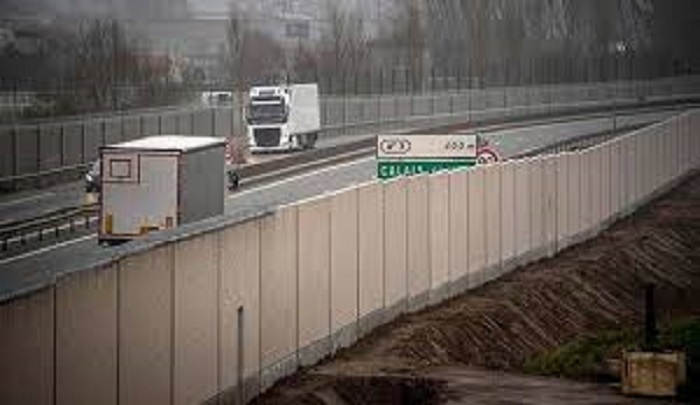 A Total spokesman confirmed the barrier was built at the request of the Calais prefecture to “protect customers, staff, and migrants,” the Daily Mail reports, with locals comparing it to the wall that U.S. President Donald Trump wants to build along the southern border of the United States to stop mass illegal migration from Central and South America. “This is very political — it aims to show desperate people that they are not welcome here, and that more and more walls and police will be used to keep them out. There are an estimated 600 mostly male migrants hailing from Afghanistan, Iran, and Syria squatting in makeshift camps around the port town waiting to break into Britain — down from an estimated 10,000 during the heyday of the infamous “Calais Jungle”. It is believed to be the first time that a wall has been so quickly erected in a hotspot area for trafficking with the intention of stopping migrants attempting to make the journey to the United Kingdom….. EDITORS NOTE: This Jihad Watch column with images is republished with permission. The featured photo is by Benny Jackson on Unsplash.